The Pontiac GTO changed all that. Back in the day, so called hot rudders knew that if you wanted to go faster, you had to go smaller and that is what General Motors did with the GTO option. The car maker didn’t even promote the car in the beginning, not even putting out a brochure on it until after it was a success. Sales of the Pontiac GTO caught car makers off guard and sent them scrambling to clone the success. Just one year after its introduction to the marketplace, the 1965 Pontiac GTO sold more than 75,000 cars in one year. This figure was double the number of 1964s sold the previous year. Sales were boosted by word of mouth as well as an article in Car and Driver magazine in which a GTO was matched against a Ferrari. In August of 1965, GM also introduced a dealer cold air induction kit for the GTO. This kit made the hood scoop fully function and also gave birth to Ram Air. GM continued the Ram Air package in 1966. There were a few factories built Pontiac GTOs with Ram Air, and these were called XS GTOs. General Motors managed to fill all orders for its popular 1965 Pontiac GTO despite being crippled by a UAW strike that year. The restyled 1965 GTO sported vertical headlights with a single hood scoop replacing the dual scoops of the year before. The 1965 Goat, as it was called by fans, boasted 335 horsepower thanks to improved camshafts and intake manifolds for the four barrel 389 and 360 tri-power topped engines. The taillights were concealed until they were turned on by six chrome ribs that ran from quarter panel to quarter panel. Buyers could opt for rally I wheels, if they chose. The Pontiac GTO had a new A-body platform. The A-body platform can also be seen in Pontiac Tempests, Leman’s, F85, Cutlass, Skylark and Cheverly to name just a few. 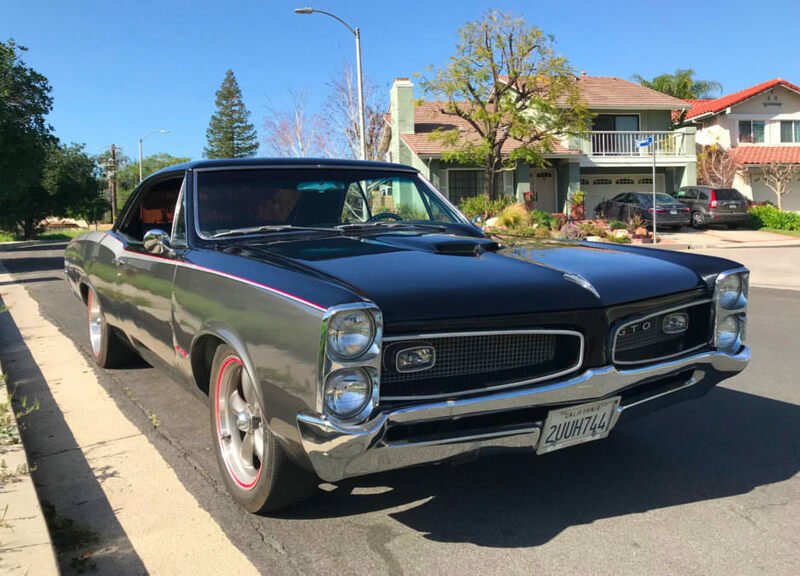 The favorite GTO option package was a 325 horsepower 389 cubic inch V8 with a 421 cylinder head, dual exhausts, four barrel carburetor, special hydraulic lifters, three speed manual stick, with heavy duty suspension, twin simulate hood scoops and bucket seats. When General Motors introduced the GTO for sale, it was hoping to move 5,000 units. In the first year it sold 32,450 units. The famous Pontiac GTO has invaded the entertainment scene for a moment or two by means of movies and music. In 2002, Vin Diesel’s Triple X movie showcased a purple GTO, complete with the classic split grill front-end design and two-door component. The surf rock group, Ronny & the Daytona’s even made a song out of this car that was included in the Billboard Hot 100 sometime in 1964. The original GTO was, in fact, a redesign of the Tempest model, but it was given a much bigger engine, the 389 CID. The model name for this car was drummed up by John DeLorean who took it from the Ferrari 250 GTO. The letters stood for Gran Truism Homologate an Italian term. However, there was dissension among the executives at Pontiac, who believed that the bigger engine in a smaller car would not sell very well. When Pontiac’s new car was released, there was a lot of tension among the executives at the manufacture, specifically Elliot Estes who approved the model designs. Since the GTO was so overwhelmingly successful, we may never know what would have happened if it had failed. Estes may have lost his job, as well as other chief designers and executives. Of course, as we all know, they really had nothing to fear as this car became a legend. Thankfully, they were rewarded for thinking outside the box. The Pontiac GTO was one of the best selling muscle cars from the mid-60s until the decline of these type of cars in the mid-70s. The entire muscle car industry was hit badly by several factors that led to the death of this era. This included environmental regulations placed on all car manufacturers to lower emissions, rising insurance prices for these types of cars, and possibly the worst being the rise in gas cost. If you are just learning about muscle cars, I suggest you start with the Pontiac GTO. This car alone has created more fans of this hobby, then any I know of besides perhaps the Mustang. I suggest that you see one of these cars in person by either going to a car auction or to a car show. You truly must see one of these cars in mint condition to truly appreciate its beauty. Author Blog:-. David Warne is a well-known Automobiles with the abilities to keep a track and predict the market trends with the utmost accuracy. He has worked on different Automobiles sectors dealing with the entire range of Automobiles. He is also an expert in writing many Automobiles related articles and blogs, so He is a renowned finance blogger too.